Postfix is not accepting outside email. Ack ack ack. Do I replace it with qmail or sendmail or what? Ack ack ack. smbmount works if you do it right. Heh heh. Okay, yes, the linux box is running, and the apache web server seems to be running flawlessly, there are a few niggling details that still have yet to be worked out. Although mySQL is running, DBI and DBD have not been installed for perl. What the crap? Is this why we installed linux mandrake? It seems like if a person selects the “everything” option it should install something as vastly useful as DBI and DBD. I realise that not evceryone will be using them, but c'mon, that's why you go through and weed out the things that you don't need. Oh well, at least sendmail is working, right? Wrong. Instead of installing sendmail or qmail, postfix was installed. Now, postfix might be great mail software, but was doesn't it show up in linuxconf? Instead, linuxconf references sendmail and appears to edit the sendmail files. Why isn't mandrake more intelligent? Samba at least installed correctly the second time and runs pretty smoothly. However, I can't get smbmount to work. I want to be able to get the files off of my windows box. Ack! How am I supposed to make a smooth transition to linux if my old files are a mile away. Why should I ftp? All bitching aside, the linux box is pretty sweet, despite running on a Cyrix P150+ circa 1996. The web serving is much faster than on my windows box, where I was running Omnihttpd. The windows box is a Pentium 200 running win98. Ack. At least the linux box hasn't randomly eaten itself. Just when I had the linux box installed for the first time, the windows box decided that it wanted nothing to do with TCP/IP anymore. A whole day of reinstalling later it was all okay again. I now have two useful computers in my apartment- a true lesson in frugal computing. However, neither one is really doing what I want them to do, but at least it seems like I can make progress with the linux box. Ah, the trials and tribulations of personal computing. I had planned to put my own comics here, but it seems that the name of my fave character has been taken. Oh well. I’m not really a fanboy. I haven’t read superhero comics since I was just a wee lad poking around in the closet and discovering my (now ex-) stepfather’s stash of comics. Marvel, DC, all that good stuff. Nowadays I like the indie stuff- personal comics with an intimate bent. Either that or wicked humor. Reduction was a local publication that I dug. Now it is something else. Instructions: Assemble the pages in order. For a really pro look, copy the cover onto cardstock and do the rest of the pages front and back on plain paper. 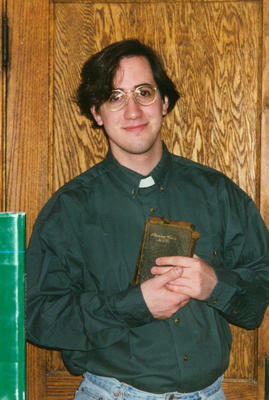 This is to certify that the bearer hereof Reverend Jesse Patrick Mullan has been ordained this Fourth day of November, 1995. We believe everyone is already a member of the church and is just not aware of it as yet. The church encourages (and I ask) that you ordain your friends and relatives on the web site. The ordination of new ministers is the single most important act a new minister can perform to promote the growth and welfare of the church as a body of believers in the right of freedom of religion and to do that which is right. The Universal Life Church will ordain anyone that asks without question of faith, for life, without a fee. The church has two tenets: the absolute right of freedom of religion and to do that which is right. Anything else, within the law, is allowed. As an ordained minister of the church, you too may ordain new ministers. The Universal Life Church will not stand between you and your God and recognizes that each person must choose his own path. Each person in the ULC is free to follow any path as long as it does not infringe on the rights of others. YOU are authorized to contact your local media sources and “show them the way” to the church’s WWW site and when there is a story or feature about the church, the Universal Life Church will bestow upon you the Doctor of Divinity Degree. No other church or denomination grants such authority and respect. Be sure to check out the site later this month. It is being GREATLY enhanced with many of the church’s publications, including THE UNIVERSAL LIFE CHURCH TEXTBOOk, available for viewing and FTP downloading free of any costs. NEXT month there will be video and audio clips added. MANY of the degrees, courses of instruction, and even the SAINT CERTIFICATE will be available for viewing. Keep track of the web site and things will be happening!